Cedar Bluff is literally an answer to prayer. My Dad has been living there for 6 months and loves it! Before he moved to Cedar Bluff, he was receiving home health care following a hospital stay. Unfortunately, he felt like a prisoner in his own home and, the home health care workers weren't the best. 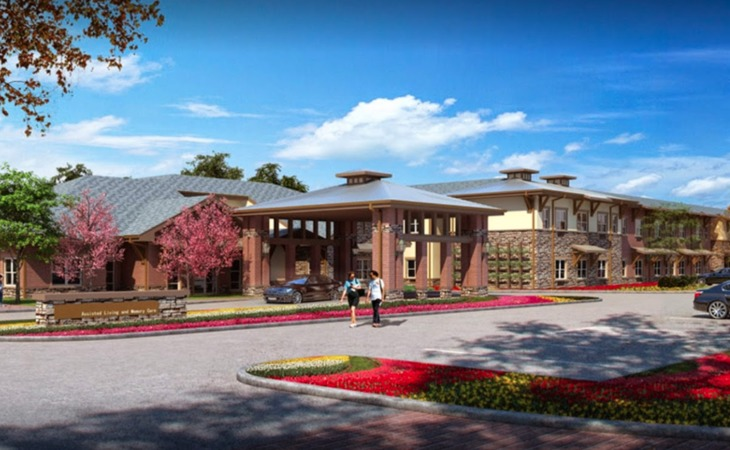 We started looking at assisted living communities to consider other options. Cedar Bluff was the 3rd place we looked at, but we both knew by the end of the visit that this was the place for him. My Dad's apartment is the smallest they have but still roomy with a great floor plan and view. The rest of Cedar Bluff is also beautiful, inviting, smells nice, and they even play great music! We love that Dad can be social, exercise his mind with games, body with exercise classes, and spirit with Bible study, but he can also have privacy in his own pretty apartment. He also has 3 great meals prepared for him in the dinning room, cleaning and laundry service, fun outings, and even live music! The staff couldn't be more warm, caring, supportive, and helpful. Dad is an independent person who didn't love the idea of assisted living, but he told me that he's surprised how quickly Cedar Bluff has felt like home. He is thriving, challenging himself, and has a sense of purpose. As his daughter, I am so very thankful for the outstanding, loving care he is receiving at Cedar Bluff. Don't hesitate to take a tour and see for yourself. Cedar Bluff is a blessing! I viewed a number of facilities before I decided to move my mother to Cedar Bluff. The rooms and facilities are large and very attractive. On mom's first day, she had a number of staff stop by her room to introduce themselves to her. I loved that. All the staff are phenomenal , friendly and professional. They bent over backwards to help us move my mother in, despite her having to give a 30 day notice where she previously lived. They wanted to make sure to move her to a safe environment. Unfortunately my mother's help took a sudden turn for the worse and she returned from the hospital on hospice. Staff would stop by to check on not only her, but on us as well. They made sure her critical care nurses were fed. After mother passed, they made sure we knew they were not going to rush us out and to take all the time we needed. My husband loves it so much there, he is now a volunteer! I would like to thank the staff at Cedar Bluff for all you have done for my mother.. My sister and I took my mother to look for an assistant living home. We looked at six, some were not friendly, some were dark and others were dirty. As soon as we walked into Cedar Bluff we knew we had found her home. T he office smelled wonderful and we were greeted with the biggest smile. Mary and Renee showed us, the efficiency and one bedroom. Both apartments were very light and airy and the residents were so happy and friendly. My mother was planning on moving in the fall, but when she called me the next day she said, “You may think I am crazy but I want to move now”. Two weeks later we were moving her in. As we were moving, residents introduce themselves and acted as one big family. The staff when above and beyond to make us comfortable, they hung her TV, put up her shoe rack up, and they even cleaned up their mess! God has blessed our mother and we will never be able to repay Cedar Bluff for all the love they have showed our mother. We can all rest a little easier since she in such loving hands. Cedar Bluff has been great for my Dad. Just being around others his age and the care and concern of the staff has been great. The staff care go above and beyond to make them comfortable and happy. They keep them busy with games and activities. We waited a long time to make this decision and my Dad has improved since he has been there. He is very happy. We saw Cedar Bluff, and we liked the overall location. The issue was that they do not accept my sister’s insurance or her Medicaid. The staff was very professional. Cedar Bluff was very nice, very well maintained and had very nice rooms and friendly staff. There wasn't much land; they were kind of in a parking lot. There was a courtyard with a green area. The building was kept up and quite nice. Some of the rooms, although nice, were still very small and made for two people. It would need to be two people who are very much in love with each other because there was really no way to get away from each other in the very small living space; smaller than what my parents could tolerate. Cedar Buff is by far the nicest place that we visited. It is not the cheapest one, but they are the nicest one. This is a brand-new facility. The room and staff are really good. My mother is kept busy all day long. The staff has them playing games and takes them out for a ride around the community. They do things and have a hair stylist that comes once a week to do their hair. The food is good, and she likes the it. They have therapy that comes in. She was in a wheelchair when she got there two months ago, and now she’s already walking with a walker and getting around. It has been a really good experience for her, and I am just proud that she is doing so well. Cedar Bluff Assisted Living was very nice. All the people were very helpful; they took me all around and showed me everything. I got to talk to some of the residents and it was a good tour. I felt like I received a lot of good information from them. We really liked Cedar Bluff. Our visit was very informative and very thorough. We were very impressed with it. It's brand new and my parents would be getting in on the ground floor. It has memory care and assisted living and they are going to have a one-bedroom apartment that's around 600 square feet. They are going to have a craft area. Right now, they only have three patients because they're still doing the final stages of being approved by the State, but they have a full-time chef that serves the meals. They provide housekeeping and laundry services once a week, which are all included in the price. They have ala carte where you only pay for the services that you need and it goes by point system. They also have transportation. It's a good setup. They have a beauty shop and a gardening club. They're going to have a woodworking shop, a gardening shop for people who wants to garden, and hobby areas to help them continue on to stay active and busy. If I was at a point where I needed to go in some place, that would be where I would go. The halls are wider, whiter color, and felt more uplifting. They even offered a seminar on things that we need to ask when we're moving mom and dad. They were helpful. The rooms are very nice. They are a very good size. The staff is wonderful, they are friendly, warm and helpful. The residents have plenty of activities from bingo, puzzles, gardening, movies and outings. They have entertainers come in and they also have a beauty shop with is wonderful for those that don't like going out. I have had my mother-in-law in Cedar Bluff memory care for almost a year, and I can say that this facility was the best choice we could have ever made. The staff is very friendly, helpful, professional and caring. The facilities are top notch and my mother-in-law loves it there. I just moved my mother to Cedar Bluff assisted living, and she is very happy with this move. My wife and I could not be more pleased with the care our moms are getting now. Cedar Bluff is exactly what we needed for my Mom. She was one of the first residents in Memory Care and I won't lie to you it was a struggle at first. Before moving to C.B. she had lived in the country on a ranch and was isolated. She wasn't very social and Cedar Bluff has done wonders with her. The staff has been a real blessing bringing her out of her shell. She still has her quirks but they all are so understanding and do everything they can to make her happy. I have visited other Memory Care facilities and they seem to have wanted her to conform to their style of care. Cedar Bluff did just the opposite. They looked at my Mom and her background and needs and they worked hard to conform to her needs.. She has so much peace of mind there. And that is what give us, her family peace of mind too! Could not be happier with our choice for our sweet Mom. Companion Suites: We Do Not Offer Companion Suites. We have two living options under one roof. Assisted Living is ideal for residents who value their independence, but may need assistance with daily activities. Our community team members are raving fans of encouraging independence with assistance readily accessible at all times of day. Memory Care is for our Elders who are living with some form of memory loss. Every member of the Cedar Bluff team is NIDE (National Institute for Dementia Education) certified. That includes everyone from the chefs and housekeepers to the concierge and nurses. The education allows us to interact with our memory care residents as unique individuals rather than objects in need of care. Residents are engaged with the goal of helping them recapture moments of memories and the recognition of loved ones. What should caregivers and potential residents know about Cedar Bluff Assisted Living & Memory Care?